For other uses, see Dead reckoning (disambiguation). The navigator plots their 9am position, indicated by the triangle, and, using their course and speed, estimates their own position at 9:30am and 10am. In navigation, dead reckoning is the process of calculating one's current position by using a previously determined position, or fix, and advancing that position based upon known or estimated speeds over elapsed time and course. The corresponding term in biology, used to describe the processes by which animals update their estimates of position or heading, is path integration. Drift is the angle between the heading of the airplane and the desired track. A is the last known position (fix, usually shown with a circle). B is the air position (usually shown with a plus sign). C is the DR position (usually shown with a triangle). Dead reckoning is subject to cumulative errors. Advances in navigational aids that give accurate information on position, in particular satellite navigation using the Global Positioning System, have made simple dead reckoning by humans obsolete for most purposes. However, inertial navigation systems, which provide very accurate directional information, use dead reckoning and are very widely applied. By analogy with their navigational use, the words dead reckoning are also used to mean the process of estimating the value of any variable quantity by using an earlier value and adding whatever changes have occurred in the meantime. Often, this usage implies that the changes are not known accurately. The earlier value and the changes may be measured or calculated quantities. The term "dead reckoning" was not originally used to abbreviate "deduced reckoning," nor is it a misspelling of the term "ded reckoning." The use of "ded" or "deduced reckoning" appeared much later in history, no earlier than 1931; in contrast to "dead reckoning" appearing as early as 1613 in the Oxford English Dictionary. The original intention of "dead" in the term is not clear however. Whether it is used to convey "absolute" as in "dead ahead," reckoning using other objects that are "dead in the water," or using reckoning properly "you’re dead if you don’t reckon right," is not known. Dead reckoning can give the best available information on position, but is subject to significant errors as both speed and direction must be accurately known at all instants for position to be determined accurately. For example, if displacement is measured by the number of rotations of a wheel, any discrepancy between the actual and assumed travelled distance per rotation, due perhaps to slippage or surface irregularities, will be a source of error. As each estimate of position is relative to the previous one, errors are cumulative, or compounding, multiplicatively or exponentially, if that is the co-relationship of the quanta. The accuracy of dead reckoning can be increased significantly by using other, more reliable methods to get a new fix part way through the journey. For example, if one was navigating on land in poor visibility, then dead reckoning could be used to get close enough to the known position of a landmark to be able to see it, before walking to the landmark itself — giving a precisely known start point — and then setting off again. Localizing a static sensor node is not a difficult task because attaching a GPS device suffices the need of localization. But a mobile sensor node, which continuously change its geographical location with time is difficult to localize. Mostly mobile sensor nodes within some particular domain for data collection can be used, i.e, sensor node attached to an animal within a grazing field or attached to a soldier on a battlefield. Within these scenarios a GPS device for each sensor node cannot be afforded. Some of the reasons for this include cost, size and battery drainage of constrained sensor nodes. To overcome this problem a limited number of reference nodes (with GPS) within a field is employed. These nodes continuously broadcast their locations and other nodes in proximity receive these locations and calculate their position using some mathematical technique like trilateration. For localization, at least three known reference locations are necessary to localize. Several localization algorithms based on Sequential Monte Carlo (SMC) method have been proposed in literatures. Sometimes a node at some places receives only two known locations and hence it becomes impossible to localize. To overcome this problem, dead reckoning technique is used. With this technique a sensor node uses its previous calculated location for localization at later time intervals. For example, at time instant 1 if node A calculates its position as loca_1 with the help of three known reference locations; then at time instant 2 it uses loca_1 along with two other reference locations received from other two reference nodes. This not only localizes a node in less time but also localizes in positions where it is difficult to get three reference locations. In studies of animal navigation, dead reckoning is more commonly (though not exclusively) known as path integration. Animals use it to estimate their current location based on their movements from their last known location. Animals such as ants, rodents, and geese have been shown to track their locations continuously relative to a starting point and to return to it, an important skill for foragers with a fixed home. In marine navigation a "dead" reckoning plot generally does not take into account the effect of currents or wind. 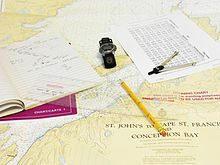 Aboard ship a dead reckoning plot is considered important in evaluating position information and planning the movement of the vessel. Dead reckoning begins with a known position, or fix, which is then advanced, mathematically or directly on the chart, by means of recorded heading, speed, and time. Speed can be determined by many methods. Before modern instrumentation, it was determined aboard ship using a chip log. More modern methods include pit log referencing engine speed (e.g. in rpm) against a table of total displacement (for ships) or referencing one's indicated airspeed fed by the pressure from a pitot tube. This measurement is converted to an equivalent airspeed based upon known atmospheric conditions and measured errors in the indicated airspeed system. A naval vessel uses a device called a pit sword (rodmeter), which uses two sensors on a metal rod to measure the electromagnetic variance caused by the ship moving through water. This change is then converted to ship's speed. Distance is determined by multiplying the speed and the time. This initial position can then be adjusted resulting in an estimated position by taking into account the current (known as set and drift in marine navigation). If there is no positional information available, a new dead reckoning plot may start from an estimated position. In this case subsequent dead reckoning positions will have taken into account estimated set and drift. Dead reckoning positions are calculated at predetermined intervals, and are maintained between fixes. The duration of the interval varies. Factors including one's speed made good and the nature of heading and other course changes, and the navigator's judgment determine when dead reckoning positions are calculated. Before the 18th-century development of the marine chronometer by John Harrison and the lunar distance method, dead reckoning was the primary method of determining longitude available to mariners such as Christopher Columbus and John Cabot on their trans-Atlantic voyages. Tools such as the traverse board were developed to enable even illiterate crew members to collect the data needed for dead reckoning. By this time, and without the aid of instruments, Polynesian navigation had developed their own wayfinding techniques to the point where the Tahitian navigator, Tupa'ia, could repeatedly demonstrate to Captain Cook (in 1769-70) his ability to point accurately back toward Tahiti, even after following a convoluted route around New Zealand to reach Australia. On May 21, 1927 Charles Lindbergh landed in Paris, France after a successful non-stop flight from the United States in the single-engined Spirit of St. Louis. This aircraft was equipped with very basic instruments. He used dead reckoning to find his way. Dead reckoning in the air is similar to dead reckoning on the sea, but slightly more complicated. The density of the air the aircraft moves through affects its performance as well as winds, weight, and power settings. The basic formula for DR is Distance = Speed x Time. An aircraft flying at 250 knots airspeed for 2 hours has flown 500 nautical miles through the air. The wind triangle is used to calculate the effects of wind on heading and airspeed to obtain a magnetic heading to steer and the speed over the ground (groundspeed). Printed tables, formulae, or an E6B flight computer are used to calculate the effects of air density on aircraft rate of climb, rate of fuel burn, and airspeed. A course line is drawn on the aeronautical chart along with estimated positions at fixed intervals (say every ½ hour). Visual observations of ground features are used to obtain fixes. By comparing the fix and the estimated position corrections are made to the aircraft's heading and groundspeed. Dead reckoning is on the curriculum for VFR (visual flight rules - or basic level) pilots worldwide. It is taught regardless of whether the aircraft has navigation aids such as GPS, ADF and VOR and is an ICAO Requirement. Many flying training schools will prevent a student from using electronic aids until they have mastered dead reckoning. Inertial navigation systems (INSes), which are nearly universal on more advanced aircraft, use dead reckoning internally. The INS provides reliable navigation capability under virtually any conditions, without the need for external navigation references, although it is still prone to slight errors. Dead reckoning is today implemented in some high-end automotive navigation systems in order to overcome the limitations of GPS/GNSS technology alone. Satellite microwave signals are unavailable in parking garages and tunnels, and often severely degraded in urban canyons and near trees due to blocked lines of sight to the satellites or multipath propagation. In a dead-reckoning navigation system, the car is equipped with sensors that know the wheel circumference and record wheel rotations and steering direction. These sensors are often already present in cars for other purposes (anti-lock braking system, electronic stability control) and can be read by the navigation system from the controller-area network bus. The navigation system then uses a Kalman filter to integrate the always-available sensor data with the accurate but occasionally unavailable position information from the satellite data into a combined position fix. Dead reckoning is utilized in some lower-end, non mission-critical, or tightly constrained by time or weight, robotic applications. It is usually used to reduce the need for sensing technology, such as ultrasonic sensors, GPS, or placement of some linear and rotary encoders, in an autonomous robot, thus greatly reducing cost and complexity at the expense of performance and repeatability. The proper utilization of dead reckoning in this sense would be to supply a known percentage of electrical power or hydraulic pressure to the robot's drive motors over a given amount of time from a general starting point. Dead reckoning is not totally accurate, which can lead to errors in distance estimates ranging from a few millimeters (in CNC machining) to kilometers (in UAVs), based upon the duration of the run, the speed of the robot, the length of the run, and several other factors. With the increased sensor offering in smartphones, built-in accelerometers can be used as a pedometer and built-in magnetometer as a compass heading provider. Pedestrian dead reckoning (PDR) can be used to supplement other navigation methods in a similar way to automotive navigation, or to extend navigation into areas where other navigation systems are unavailable. In a simple implementation, the user holds their phone in front of them and each step causes position to move forward a fixed distance in the direction measured by the compass. Accuracy is limited by the sensor precision, magnetic disturbances inside structures, and unknown variables such as carrying position and stride length. Another challenge is differentiating walking from running, and recognizing movements like bicycling, climbing stairs, or riding an elevator. Before phone-based systems existed, many custom PDR systems existed. While a pedometer can only be used to measure linear distance traveled, PDR systems have an embedded magnetometer for heading measurement. Custom PDR systems can take many forms including special boots, belts, and watches, where the variability of carrying position has been minimized to better utilize magnetometer heading. True dead reckoning is fairly complicated, as it is not only important to minimize basic drift, but also to handle different carrying scenarios and movements, as well as hardware differences across phone models. The south-pointing chariot was an ancient Chinese device consisting of a two-wheeled horse-drawn vehicle which carried a pointer that was intended always to aim to the south, no matter how the chariot turned. The chariot pre-dated the navigational use of the magnetic compass, and could not detect the direction that was south. Instead it used a kind of directional dead reckoning: at the start of a journey, the pointer was aimed southward by hand, using local knowledge or astronomical observations e.g. of the Pole Star. 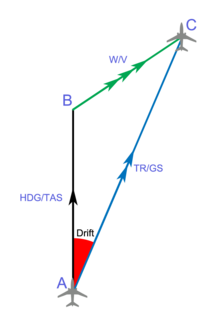 Then, as it traveled, a mechanism possibly containing differential gears used the different rotational speeds of the two wheels to turn the pointer relative to the body of the chariot by the angle of turns made (subject to available mechanical accuracy), keeping the pointer aiming in its original direction, to the south. Errors, as always with dead reckoning, would accumulate as distance traveled increased. This formula is used to move the object until a new update is received over the network. At that point, the problem is that there are now two kinematic states: the currently estimated position and the just received, actual position. Resolving these two states in a believable way can be quite complex. One approach is to create a curve (ex cubic Bézier splines, centripetal Catmull–Rom splines, and Hermite curves) between the two states while still projecting into the future. Another technique is to use projective velocity blending, which is the blending of two projections (last known and current) where the current projection uses a blending between the last known and current velocity over a set time. In computer science, dead-reckoning refers to navigating an array data structure using indexes. Since every array element has the same size, it is possible to directly access one array element by knowing any position in the array. This property is particularly important for performance when used in conjunction with arrays of structures because data can be directly accessed, without going through a pointer dereference. ^ Adams, Cecil. "Is "dead reckoning" short for "deduced reckoning"?". straightdope.com. Retrieved 2018-02-02. ^ Hu, Lingxuan; Evans, David (2004-01-01). Localization for Mobile Sensor Networks. Proceedings of the 10th Annual International Conference on Mobile Computing and Networking. MobiCom '04. New York, NY, USA: ACM. pp. 45–57. CiteSeerX 10.1.1.645.3886. doi:10.1145/1023720.1023726. ISBN 978-1-58113-868-9. ^ Mirebrahim, Hamid; Dehghan, Mehdi (2009-09-22). Ruiz, Pedro M.; Garcia-Luna-Aceves, Jose Joaquin (eds.). Monte Carlo Localization of Mobile Sensor Networks Using the Position Information of Neighbor Nodes. Lecture Notes in Computer Science. Springer Berlin Heidelberg. pp. 270–283. doi:10.1007/978-3-642-04383-3_20. ISBN 978-3-642-04382-6. ^ Turuk, Haroon (2015). "IET Digital Library: Dead reckoning localisation technique for mobile wireless sensor networks". IET Wireless Sensor Systems. 5 (2): 87–96. arXiv:1504.06797. doi:10.1049/iet-wss.2014.0043. ^ Gallistel. The Organization of Learning. 1990. ^ "Transport Canada TP13014E Sample Private Pilot Examination". Transport Canada. Retrieved 8 October 2013. ^ "ICAO Annex 1 Paragraph 2.3.4.2.1 h" (PDF). ICAO. Retrieved 18 October 2016. ^ Pedestrian Dead Reckoning (PDR) Simplified. GT Silicon. Retrieved 22 January 2018. ^ a b Murphy, Curtiss. Believable Dead Reckoning for Networked Games. Published in Game Engine Gems 2, Lengyel, Eric. AK Peters, 2011, p 308-326. ^ Van Verth, James. Essential Mathematics for Games And Interactive Applications. Second Edition. Morgan Kaufmann, 1971, p. 580. ^ Lengyel, Eric. Mathematics for 3D Game Programming And Computer Graphics. Second Edition. Charles River Media, 2004. ^ Gil Tene and Martin Thompson. "org.ObjectLayout, A layout-optimized Java data structure package". objectlayout.org. Retrieved 19 October 2015. This page was last edited on 4 April 2019, at 02:44 (UTC).